Oh baby, have we been working hard for your arrival! Anyway, our kitchen table was in major need of a touch up. 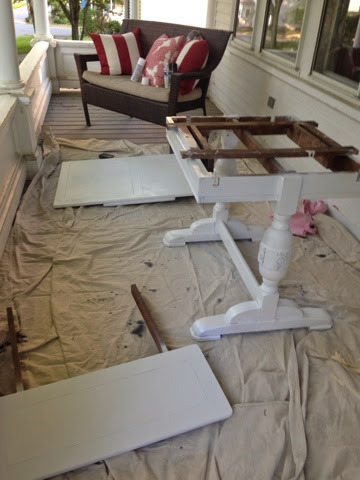 I snagged this little gem at an antique store years ago and have been meaning to sand it down and paint it a true white since the day I bought it. Who knew all it would take is a baby on the way to get this project finished! And here she is all put back together and a shiny white. 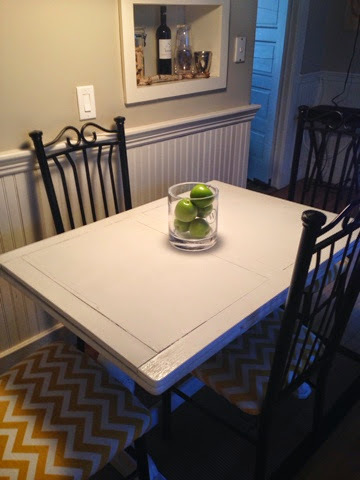 There were stains on the table for years of dinner times, projects and who knows what, so while the difference isn't super dramatic, it makes me feel like the table is finally clean! Ok, project #2 is definitely the one I'm most excited about! 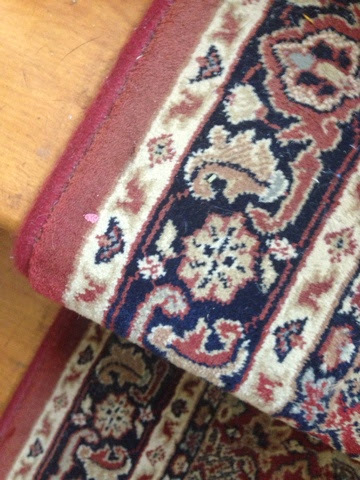 I have wanted to rip out this nasty, faux-Oriental, ripped, million year old carpet runner since they day I laid eyes on it. Justin thought that was ridiculous and I couldn't disagree more. That rug was filthy, covered in the previous owners dirt and dog hair and impossible to clean. My own mom cleaned it on her hands and knees and then told me to rip it out. Two different cleaning ladies told me to rip it out...I mean, come on...that thing needed to go. After hating the runners for the better part of a year, in a fit of pregnancy rage, I ripped out the hallway runner with my bare hands. 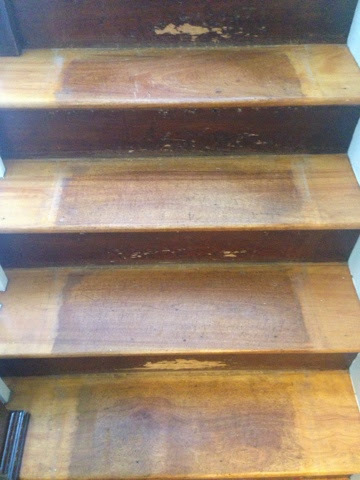 To be fair, we had water damage this winter and the stair runner got wet to the pad so our insurance company filled our claim to have it removed, cleaned and re-installed. Clearly, I wasn't having that POS re-installed, so I took matters into my own hands. I figured if we did it ourselves, we could use the money to buy new runners. Cue Husband's eye roll, lecture and displeasure. 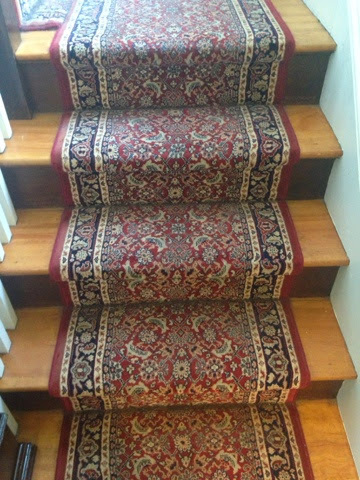 A tiny part of me hoped our floors would look so pretty undermeath that we could leave them in their natural state without rugs....um, nope. Here she is in progress: we ordered the rug pads from the same company as the runners to ensure they would be a match and then cut them to size. After the pads were installed, it was time for the real thing! I LOVE the results! 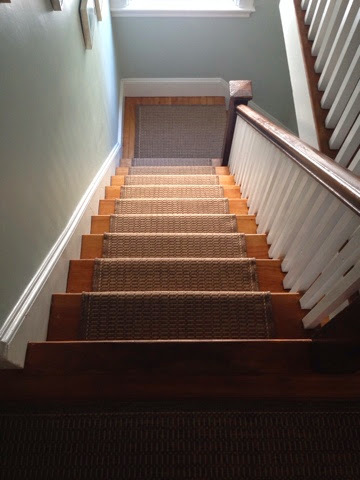 Neutral, clean, prefect for re-sale and will hopefully hide dog hair. Thanks to my husband for all of his hard work! I was pretty much useless as far as helping goes because this project calls for a lot of squatting, bending and reaching, none of which I'm really capable of at this moment. Poor husband had to do it all pretty much by himself. Justin, I promise that was the last one til baby! I'm headed to a doctor's appointment to check on my breech babe, I'll fill ya'll in tomorrow! Love how the runners came out, so impressed you did it yourselves! I can totally relate with spray painting yourself. 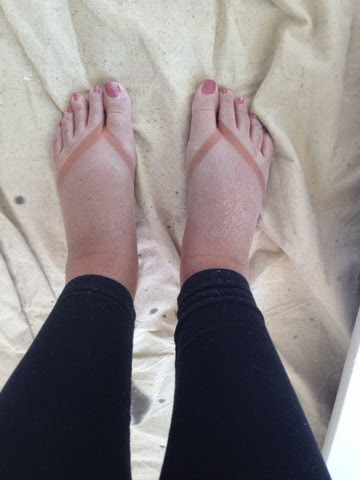 I had spray paint on me after my last project despite 3 showers! Wow, that looks awesome! The hard work definitely paid off. 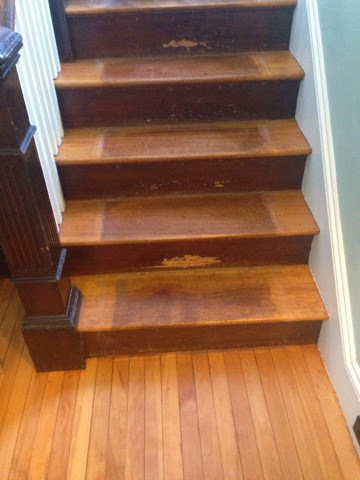 Wow those stairs look great!! 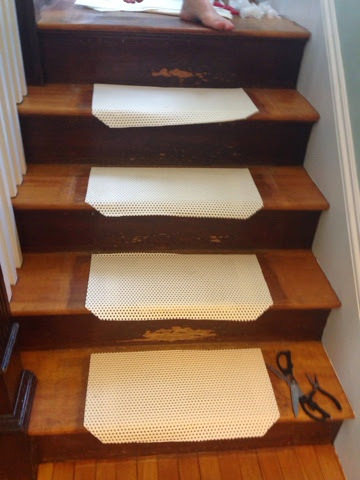 We need to do the same thing in our house...ours are completely carpeted and am hoping they are in ok enough shape to at least do a runner! You pulling out the runner in a fit of rage is SO ME! So something I would do and would probably have a look a sheer madness/crazyness/happiness all while grunting to remove the damn thing. Your nursery progress has me feeling seriously behind - we haven't even started! yay for fun projects/pregnancy induced, rage fueled nesting! Looks awesome! yay for nesting! everything looks amazing! i love the hard wood floors!